Prepare for death and eternity." These cheerless words, etched in stone, are the legend left by John Reid Wolfskill, the pioneer of Solano County. He was the first English speaking man to settle in the area around what is now Winters. There, he worked, prospered, raised a large family, and died. 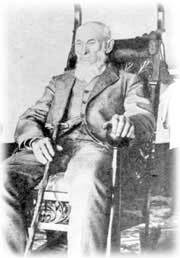 Born in 1804, John Reid Wolfskill was one of five brothers, all of whom eventually left their birthplace in Madison County, Kentucky to come west. William, the eldest, was the first to come to California. He arrive in the southwest in 1821 while the region was still held and administered by the Mexican government. He spent ten years trapping in the New Mexico area, where in 1828 he was made a Mexican citizen. Eventually, he moved west to Los Angeles, opening the Santa Fe Trail to California in the process. William Wolfskill eventually turned away from trapping and from 1838 on devoted himself wholly to the vineyards in southern California which were to make him rich and famous. Vines and fruit trees were his primary interests. He relied on mission varieties initially an experimented with these and other types. In 1857, he became the first man to plant and grow oranges commercially in California. Marrying into an influential Mexican family in 1841, he became prominent in southern California society and public life. John Wolfskill arrived in Los Angeles in Feb. 1838. He worked for his brother for two years, then he took the advice of a friend, Juan Jose Warner, and headed north to seek a place of his own. He first stopped at Sonoma to ask General Mariano Vallejo’s permission to scout the area for a suitable place to settle. The General allowed him to look over the territory, but made it clear that under no circumstances would the land be granted. Again on the advice of Warner, John Wolfskill scouted the area around what is today Winters. It was there, along the banks of Putah Creek that Wolfskill saw what he considered to be the best land for settlement. The area was slightly higher than the surrounding valley floor and the constant source of water provided by the creek a crucial factor to any agricultural was plentiful. Wolfskill relied on the presence of wild oats as an indication of soil fertility and water distribution. Mark West, a friend of Wolfskills living in Sonoma, asked Vallejo to reconsider the possibility of a grant. He refused. In 1841, Jacob P. Leese, the son-in-law of the general also intervened on Wolfskill’s behalf. If was finally agreed that a grant of four square Mexican league’s, over 17,750 acres, would be approved by Vallejo, clearing the way for a grant by the Mexican governor of California. On May 24, 1842, the grant was made by Governor Juan Bautista de Alvarado to William Wolfskill, a naturalized Mexican citizen. In that same year John Wolfskill headed out from Los Angeles with a herd of cattle, oxen, and a few horses for the property that he was later to describe as "...four leagues of the finest land in the world." Once on the property, named Rancho de Los Putos, John Wolfskill put his livestock out to graze and constructed a small shack out of mud and reeds. This served as his home for the first few years. Along with grazing cattle, Wolfskill also planted and tended fruit trees, barley, corn, beans, and vines. For the first three years water was hauled by bucket from the creek. Most of these projects were carried out by Wolfskill with the help of a few Indians who still inhabited the area. (A small pox epidemic had decimated the native population in 1837-39). Various American and Mexican adventurers who happened through the region also helped him occasionally. Until 1849, the property was in William Wolfskill’s name. In that year, one half of the property was transferred into John’s name. His portion was the section on the south side of the creek, in what is now Solano County. Legal problems arose with the land grant when California became part of the United States, but in 1854, upon the petition of William Wolfskill, the grant was confirmed by the Board of Commissioners appointed to settle private land claims in the State of California. During the more than 50 years that John D. Wolfskill lived in the Winters area, his concentration on different types of crops and products shifted. In the days before the gold rush of 1849, his main emphasis was on fruits, vegetables and livestock. When the gold rush started he was among the first purveyors of fresh fruit. By the time the mania for gold had subsided, enough of the original gold seekers and others had settled permanently in greater bay and valley areas to provide a good, steady market for Wolfskill’s produce. His ranch continued to meet the demand for fruits and vegetables in the Sacramento and San Francisco markets for the next four decades. Although there is no data on profits the estimated value of his holdings grew phenomenally. According to the U.S. Agricultural Census Schedule for 1850, Wolfskill’s total assets were valued at $5,000. By 1870, the estimate was $190,000. For transportation, Wolfskill had the insight to goods to Sacramento. Later, he hauled his produce to Suisun City and there put it on boats for San Francisco. With the connection in 1869 of the Vaca Valley and Clear Lake Railroad to Elmira, four and one-half miles away, fruit from the Winters area could be shipped to the east coast for sale by commission. Up to his death in 1897, John Wolfskill continued to grow crops of many varieties. His emphasis was heavy on wheat in the 1870’s but he eventually returned to the orchard and vine products. He had figs, olives, oranges, apricots, black walnuts, Muscat vines, Eastern Shellbark hickory nuts, pecans, French Madeira nuts, peaches, plums, apples, lemons, limes, pomegranates, almonds, persimmons, and melons of many varieties. It is difficult to determine sources for these crops. There are e references to olive and vine cuttings and figs and blood oranges from the Mission San Francisco Solano. Other reports credit shipments from Kentucky and Los Angeles as sources of seeds and products for the Wolfskill ranch. 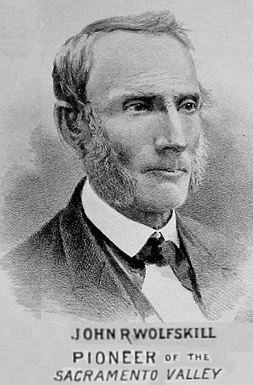 John Wolfskill’s initial success in the area was to inspire his brothers, Malthus Wolfskill, born in Howard County Missouri, in 1810. Crossing the plains with his family by ox teams, he reached his brother John’s ranch in October of that year. He settled in the Winters bridge. In 1865 he sold his holdings to Theodore Winters, founder of the town of Winters. The next year he moved to Suisun. 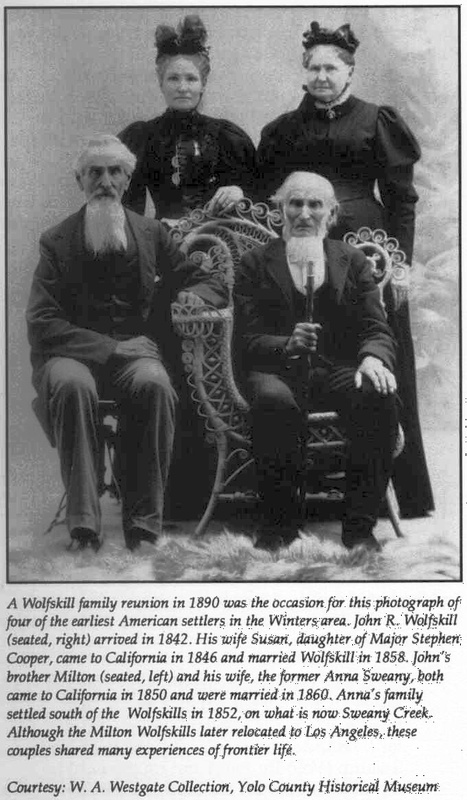 In1852, Sarchel Wolfskill brought his wife and son to the Winters area to farm alongside his brothers. With 1200 acres of land, they prospered through a career in agriculture. They lived in John Wolfskill’s house until 1874, when they built their own home. 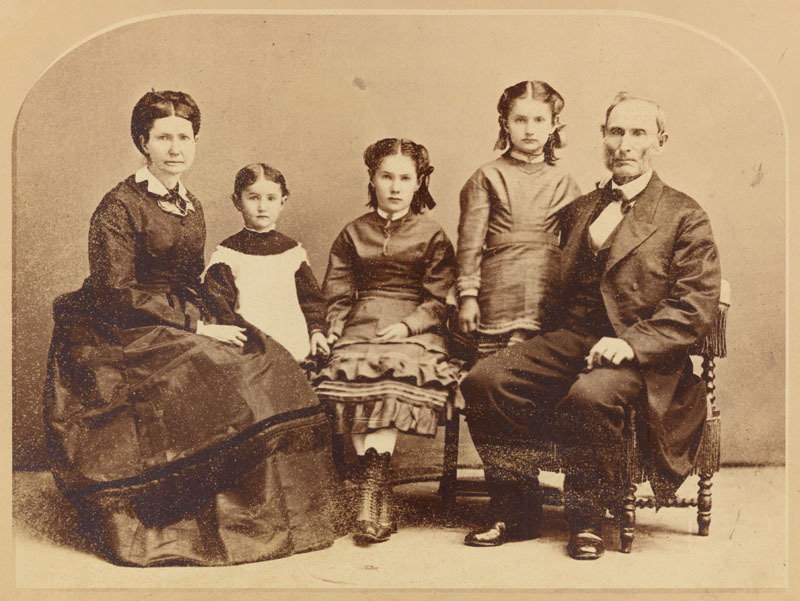 In 1858, Milton Wolfskill came to California with his wife. The house they built is still standing about seven miles west of Winters. Though obviously prominent, and a motive force for his brothers, John Wolfskill seemed unconcerned with publicity or prestige. According to his grand-daughter, he was a man without pretensions. His friends were usually other farmers or people with strong interests in the land. Not often in the public eye, he was content to graft new varieties, to experiment with new methods of pest control or irrigation, or in his later years, to read farm journals. For social ritual and entertainment, he restricted himself to visiting county and state agricultural fairs, and he frequently participated in exhibitions of farm products and on occasion, won. He was fascinated by gadgets and brought some back with him from each fair that he attended. Reportedly a generous man, he provided a small school for the children of laborers in the 1880’s and he and his wife, Susan, the daughter of Major Stephen Cooper, made calls on the poor and the sick bringing with them good wishes and baskets of vegetables, fruits and smoked meats. One of the most famous homes in the area was built in 1892 when the earthquake destroyed the Wolfskill home. Appropriately referred to as the "Wolfskill Mansion," the new building was a two-story structure built around a large central fountain and a spacious patio area. A hand painted mural was on the walls of the den, and the entire house was furnished with oriental rugs and carved oak furniture. The wall paneling was made from the wood and bark of walnut and oak trees on the property itself. This home was later destroyed by fire. At the age of eighty, when his short biographical statement was taken by a friend, John Wolfskill said that he preferred the quiet life of the country to the life of "excitement of the business man." After his death his daughter Francis took over the property and operated it with the help of her second husband, Lawrence Wilson. In 1934, when she died, she left approximately one hundred and seven acres of the grant to the Department of Pomology of the University of California, Davis, with the understanding that the property was to be used as an experimental horticulture station and the line of olive trees planted by Wolfskill in 1861 was to remain standing. In 1936, the ownership of the property was transferred and since then has been operated by the Davis campus. The accomplishments of the experimentation are impressive. Work there has resulted in the development, naming, and release for commercial orchard use of five new cling peach varieties, six new plum varieties, a new almond variety and several new strawberry varieties. Experiments are also continuing in olive, walnut and fig varieties and tests are being conducted to determine the effects of chemical thinning procedures used on apricots. Reprinted from the 1975 Centennial Edition of the Winters Express. The preceding article consists of excerpts from "John Reid Wolfskill: The Pioneer of Solano County" by Brooks C. Sackett, Unpublished MS, Term paper for History 276, U.C. Davis, December 1, 1973 (Larkey Collection). 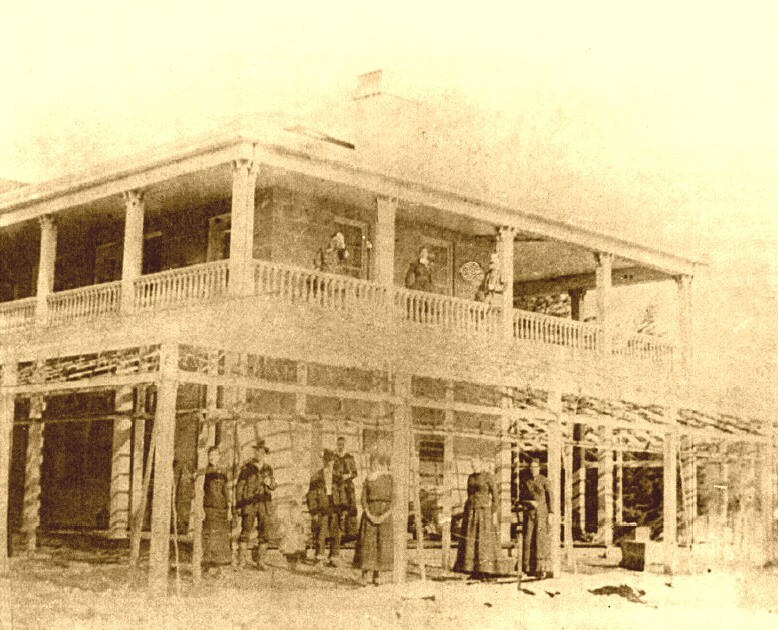 Photo taken in 1883 of the Wolfskill ranch house on Putah Creek near Winters. John Reid Wolfskill is standing third from left in front of the house, which was destroyed on April 18, 1892 by an earthquake. and replaced by another house that later burned down. This site today is part of the Wolfskill Experimental Orchard that is administered by the University of California at Davis. Photo taken about 1869 or 1870 of Mrs. Susan Wolfskill, Frances Ann "Fannie" Wolfskill (1866-1934), Malinda "Linnie" Tate Wolfskill (1860-1929), Virginia "Jennie" Lee Wolfskill (1864-1870), and Mr. John Reid Wolfskill. Not shown are Nellie (1862-1863), who died young, and Ned Wolfskill (1850-1939). Photo of the Wolfskill ranch house on Putah Creek. Written on back: "Residence of J.R. Wolfskills on Rio de los Putas Grant. Taken in midwinter with snow on ground. 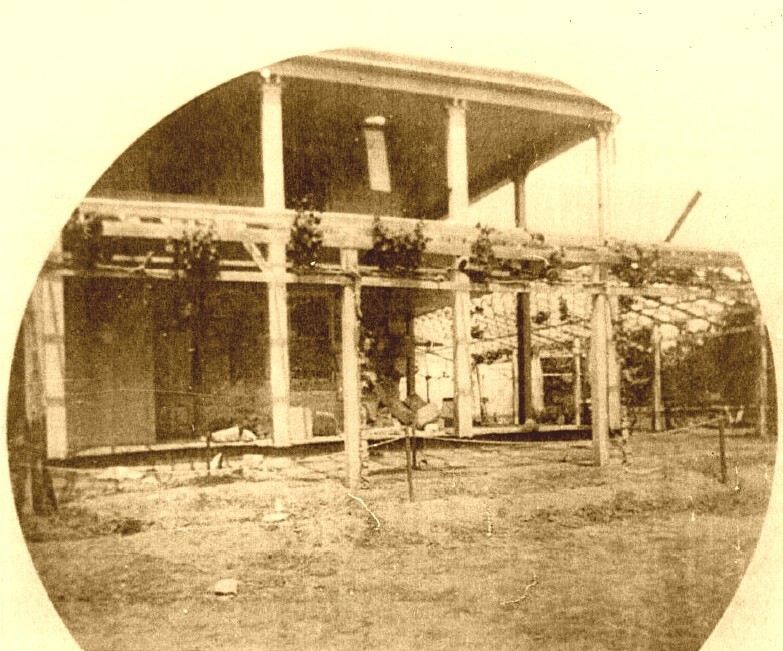 This two story stone dwelling built in Summer of 1861 was destroyed by earthquake April 18, 1892. No fatalities. Was never occupied afterward. Ruins torn down and a new house erected in its place."